If your family is anything like mine, I bet there is a bad-tempered queue outside the bathroom most mornings. At least, there used to be before we created a second bathroom, using a small space that was at the time only really being used to store junk. When we first came up with the idea, we thought it would be impossible, the space was tiny, but with a bit of research, and creativity, we were able to do it. To help you to do the same, I have put together a few tips. For a compact bathroom, combination units are the simplest answer. They are a toilet, sink and under sink storage cabinet combined. The fact that a bathroom specialist has designed them means that they are as compact as possible. However, when shopping for one bear in mind that not all combination units are specifically designed to be used in a small space. Some are made for use in a standard sized bathroom, so you need to ask to be shown the compact combination units when you go shopping. If you find that you do not have enough space for one of these units, the next best option is a compact toilet combined with a corner sink. There are plenty of both available from betterbathrooms.com. You can also buy toilets that are designed to fit into a corner. Wall hung sinks and toilets require roughly the same amount of space as other compact sanitary ware does. However, it looks smaller, which helps to create the illusion of space. In a family bathroom, you need plenty of storage. One option is to put up some long narrow shelves on the walls. However, a better solution is to put up a tall and narrow cupboard instead. If you choose one with mirror finish doors, you will make the space look bigger. This one is an obvious tip. Showers take up less space than baths, so it makes sense to install one in a small bathroom. However, it is also sometimes possible to have a bath if you opt to install a soaking tub. These take up only slightly more floor space than a standard shower tray would, so you use them in a seated position. They are actually extremely relaxing, as you will know if you have ever sat in a hot tub in someone’s back yard. If you do decide to install a shower, choose a curved one, rather than a square one. Another option is to ditch the tray, have a wet room built, and use a shower curtain rather than an enclosure. My last tip is to let a professional bathroom designer work out the details for you. 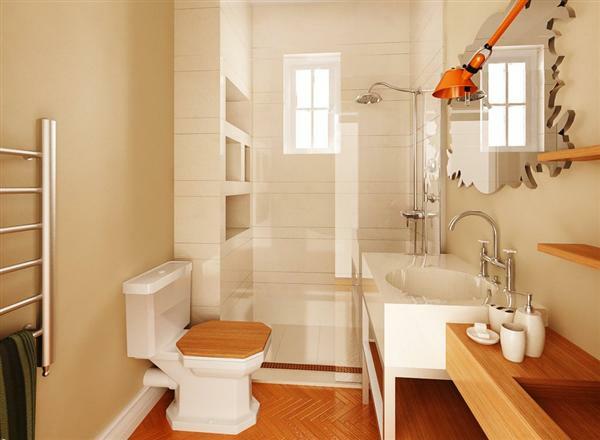 There are some fantastic compact bathroom floor plans available on this page, using them you will be able to tap into the expertise of the person who drew them without having to pay a fee.